If you would like to use the GT cars and the circuit for a street race, but have not yet found the time to read the extended version of the game rules, you should not hesitate: you can start playing straight away using the basic rules with only a few adjustments, which are explained below. In the basic rules for road races, the drivers and cars only differ in appearance. The values and symbols on the score cards are not taken into account. However, a driver may use his nitro fuel injection once a lap having rolled the gear die. This gives him a movement bonus equivalent to the gear he is in at that moment (1 space in 1st gear, 2 spaces in 2nd gear, etc).. This bonus must be used completely. The games have some special features. Please therefore read the following sections. 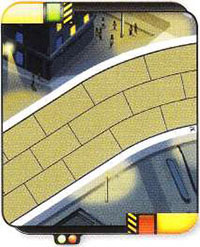 The residents find the noise of the cars extremely annoying and complain about it. Now and then a hot tempered trouble-maker decides to take pot shots at the cars driving past his window. 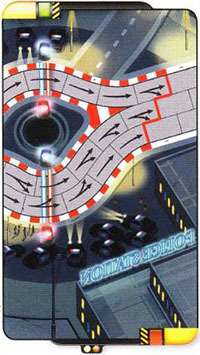 The drivers of all cars which finish up in this zone after their turn must roll the black die. If the result is 11 or more, the car loses 2 WP. The danger zone is the area of the circuit which is in particularly bad condition and is therefore dreaded by all drivers. the black die. If he rolls a number between 1 and 4 he loses 1 WP. It is possible to avoid damage by changing lane. There is a speed limit in force in the whole town, but it is great fun tearing past the police station. Every time a driver crosses this line his speed must be recorded (e.g. the number shown by the gear die, multiplied by 10). When all drivers have crossed this line, the fastest driver gets 2 WP (maximum total points: 18 WP). 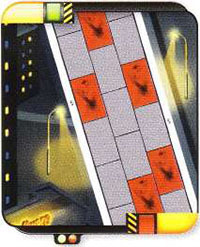 In the case of a draw, the first driver to have passed the police station receives the bonus. The spaces underneath the tunnel are not navigable. When a car leaves a space with a tunnel symbol it is placed on a space with the same number on the other side of the tunnel. If two laps are to be completed on this circuit, each car receives 10 WP when it crosses the finishing line for the first time (maximum total points: 18 WP).